The Paramedic’s scope of practice includes basic and advanced skills focused on the acute management and transportation of the broad range of patients who access the emergency medical system. This may occur at an emergency scene until transportation resources arrive, from an emergency scene to a health care facility, between health care facilities, or in other health care settings. In some communities, Paramedics provide a large portion of the out-of-hospital care and represent the highest level of out-of-hospital care. In communities that use emergency medical dispatch systems, Paramedics may be part of a tiered response system. In all cases, Paramedics work alongside other EMS and health care professionals as an integral part of the emergency care team. The Paramedic must be able to deal with adverse and often dangerous situations which include responding to calls in districts known to have high crime and mortality rates. Self-confidence is critical, as is a desire to work with people, solid emotional stability, a tolerance for high stress, and the ability to meet the physical, intellectual, and cognitive requirements demanded by this position. The Paramedic’s scope of practice includes invasive and pharmacological interventions to reduce the morbidity and mortality associated with acute out-of-hospital medical and traumatic emergencies. Emergency care is based on an advanced assessment and the formulation of a field impression. The Paramedic provides care designed to minimize secondary injury and provide comfort to the patient and family while transporting the patient to an appropriate health care facility. The Paramedic has knowledge, skills, and abilities developed by appropriate formal education and training. The Paramedic has the knowledge associated with, and is expected to be competent in, all of the skills of the EMR, EMT, and AEMT. The major difference between the Paramedic and the Advanced Emergency Medical Technician is the ability to perform a broader range of advanced skills. These skills carry a greater risk for the patient if improperly or inappropriately performed, are more difficult to attain and maintain competency in, and require significant background knowledge in basic and applied sciences. The Paramedic is the minimum licensure level for patients requiring the full range of advanced out-of-hospital care. The scope of practice is limited to advanced skills that are effective and can be performed safely in an out-of-hospital setting with medical oversight. The Paramedic transports all emergency patients to an appropriate medical facility. The Paramedic serves as part of an EMS response system, ensuring a progressive increase in the level of assessment and care. The Paramedic may make destination decisions in collaboration with medical oversight. The principal disposition of the patient encounter will result in the direct delivery of the patient to an acute care facility. 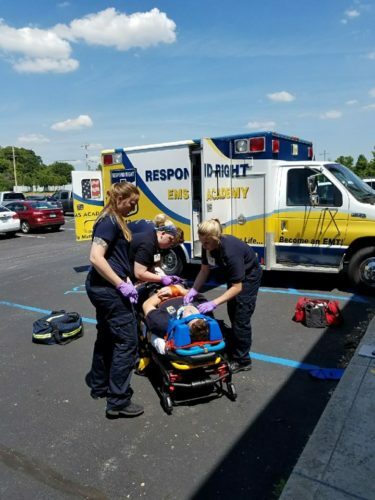 The Respond Right EMS Academy / St. Charles Community College Consortium has programmatic accreditation by the Commission on Accreditation of Allied Health Education Programs (www.caahep.org) upon the recommendation of the Committee on Accreditation of Educational Programs for the Emergency Medical Services Professions (CoAEMSP). Respond Right EMS Academy has received Training Entity Accreditation through the Missouri Department of Health and Senior Services Bureau of Emergency Medical Services. St. Charles Community College is accredited by The Higher Learning Commission of the North Central Association of Colleges and Schools, telephone: 800-621-7440; fax: 312-263-7462; website: www.ncacihe.org. The North Central accreditation, along with transfer agreements with four-year colleges and universities, assures the value of credits earned at SCC. Courses taken for credit at SCC will be accepted in transfer by other colleges, provided they are appropriate to the degree sought. Students will receive a Certificate of Completion through Respond Right EMS Academy upon completion of the Paramedic program. The EMS courses at Respond Right EMS Academy have additional admission requirements due to the physical demands and nature of the job requirements. Every student is encouraged to apply, however they are encouraged to review the job requirements and physical demands before applying. Not all applicants will be accepted into the program based on meeting the admission requirements. Respond Right EMS Academy offers equal access and opportunities in employment, admissions and educational services. RREMSA will not discriminate on the basis of race, color, ethnicity, religion, gender, pregnancy, age, marital status, national origin, genetic information, sexual orientation or disability status in its employment practices or in the admission and treatment of students. Complete policies on Americans with Disabilities, discrimination and harassment can be found in the Program Manual. If you have a question or concern, please contact Donna Weiss at 636-387-6200. These admission requirements may change and students are encouraged to consult with administration when they apply to confirm the current requirements. Official transcripts and a letter from the Program Director of the initial institution must be sent to the administrative office, Attn: Program Director, Toni Milan. The letter must document that the student is in good standing and has met all required didactic and lab hours for the courses which credit is sought. Written examination testing in all courses for which transfer credit is sought. The decision score is 75%. Each exam can be taken one time. Skills demonstration equivalent to the skills taught in the course for which transfer credit is sought. A list of skills is available with the associated NREMT Portfolio paperwork. Students will be allowed to re-test skills one time. Students are required to pay all academic fees associated with transfer credit evaluation or exemption examination. Advanced Placement does not provide advanced placement based on other healthcare provider licensures. Advanced placement only applies to the Paramedic level. The deadline to apply for advanced placement is EMS 303. Transfer students are those who wish to transfer to Respond Right EMS Academy from another CoAEMSP Accredited Institution. Students applying should be in good standing without academic or behavior related issues. Credit for EMS courses will only be granted if attended at a CoAEMSP accredited institution. Transfer students will be required to attend orientation as directed and any other required clinical training dates. Students who have a Missouri, and/or NREMT EMT License may receive credit for RREMSA’s EMT course work. Students with medical training, including nursing, military medical training, etc. are not be given advanced placement in the EMS Program. Paramedic Program outcomes can be found here. Students may register for open classes any time during the scheduled registration periods. However, students should be aware that Respond Right® EMS Academy reserves the right to change the schedule, including fees and instructor assignment, and to cancel classes appearing in the schedule. Decisions to conduct or cancel courses are made based upon enrollment levels in class sections. When a course is cancelled, staff will contact students and advise them of their options. Email info@respondright.com or call 636-387-6200 to apply Today! Seats are limited.